Hi - EU Chap Sunsesta Surf owner here (late 2017 model). After 220hrs the hull has small cracks all around the swim platform and a large crack internally (above the ballast) where the cockpit meets the hull. The first time it went back in the water this year the transom started leaking around the drive (no GRP inside of the mounting bolts - just paint - so it just gave way). When looking closely in and around the hull, the finish internally, grp work is really poor with air pockets and paint over unfinished work. 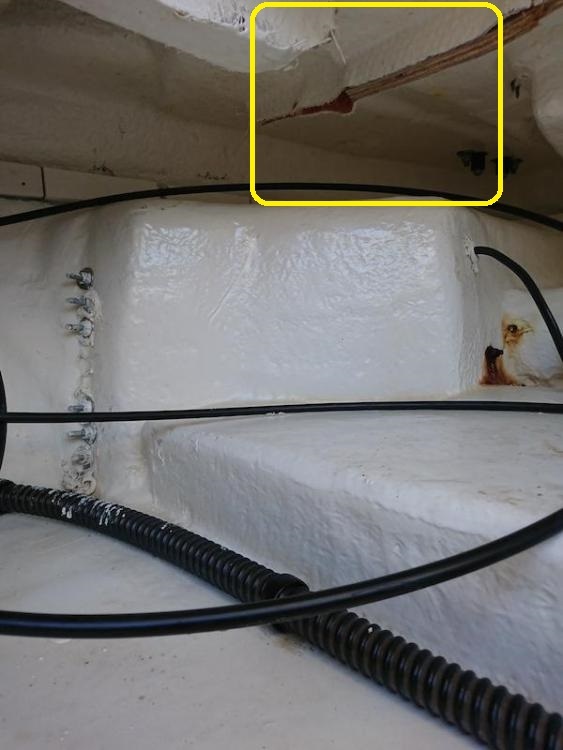 Lots of other small issues such as a multitude of small bubbles/holes in the exterior gel coat which came out when the hull was polished, bolts needing to be replaced as they rusted out. Is this type of build quality normal for a Chap or is this one a lemon? Hard to compare as we dont have a lot of them in Europe. There are always a few issues of sloppy workmanship here and there, but what you're describing seems unusually excessive. It’s common to find a few issues and have them fixed by the dealer. What you describe sounds excessive though. Do you have pictures? Did you buy the boat used ? Of did you hit something very hard with the drive section. All the small cracks & a larger one. Then had it repaired ? I can not see any other way to have rusting bolts in a 1 year old boat. They should have been S S Sounds like a drive gasket was left off also ? If you bought the boat new, this should be covered under the hull warranty. If you are the second owner and did the transfer, ditto. If either are true, I would recommend engaging Chaparral ASAP. Seems like another "drive by " poster. They come on here, complain about quality then never come back to give specifics. Possibly SeaRay employees? que the chap slappys saying the boat missing a drive or having a titanic sized leak is normal. Sounds like you got the Brexit model, similar to the Tijuana version. Actually, I've heard more complaints than ever but for the H20 Series. The older I get . The more I believe all posts. Thanks guys. Would be interesting to know where in Europe, and how many boats does Chaparral sell there a year? I remember Keith was in Hong Kong and went to a boat show and saw a Signature 310 on display. Wonder how big the foreign market is for Chaparral. Sorry for not responding earlier. Here are some images. We purchased the boat new from a UK dealer and have been trying to get it sorted out but not getting a lot of response at the moment. Thought I would wait to get a response before posting. We have gone ahead and completed some of the works on the transom. Here is some of the internal finish inside. We lifted the boat and filled the bottom with water to identify where the leak was coming from. There was no grp around the fixings so the ply gave way and it all loosened up. Another general pic of what the finish is like internally. And another pic of the drive removed and open transom. This was strengthened and grp done properly. Pic of the finish after a polish revealed small holes in the final paint finish and gel coat. Another of the finish inside. Fixing point of the transom and stern drive. Crack sitting above the balast looking inside the balast locker. Transom has paint and no grp? That hull looks just like a storm bashed around boat. The excessive staining is from being outdoors...……….. Hull should have been destroyed at the factory. Find the HIN number . Run a check on the locations of buyers & sellers before you. Yep, and TBH, they usually don't GRP or cover the cutout at the factories (at least I haven't seen it) which in this case is basically plywood core edges because they always assume that it is going to be a water-tight fitting going in there, between the transom assembly and outdrive to the inner transom shield that bolts to it through those drilled holes there. And it also appears that they over-cut that keyway because there is a bit of space between the holes and the cutout on the portside and barely anything on this starboard side. I would say that good thing you noticed it now before that plywood really got soaked and rotted but judging from the other picture, it's already far gone IMO and I think the entire 2 or 3 layers of plywood will need to be replaced. Removing just the rot and filling it with new material of whatever kind is not the way to go, especially in the last pic below. Another of the finish inside. And this here looks like whatever they're fastening on the outside was fastened with non-stainless steel nuts and bolts because they've completely rusted. That's just terrible. This was strengthened and grp done properly. That will need to be cut out completely and all rotted plywood replaced somehow. Not sure how they will do that without completely replacing the entire plywood transom core. That's a structural area and really shouldn't be pieced in. You can see how much pressure is on that bolt or stud by how it compressed the rotted plywood. I thought they stopped using plywood on their transoms? .Another general pic of what the finish is like internally. This is just awful fiberglass work. Shame on whomever was responsible for the work and for quality control inspections. Very poor construction and what is this gap where you see wood. I noticed that and didn't even know what to say about it. Looks like the top cap has two pieces with lips on them to join together and they weren't formed very well and ended up with a gap that needed to be filled in with some material to fasten the two flanges together. Why there needs to be a connection there and two separate pieces is beyond me. That cap should be a single piece all the way. I'm sure there's a reason for it but it looks poorly done. And all those 6 nuts on the left that have loads of sealant all over them are most likely the hinge for the surf gate. The wire going through the top and the completely rusted out bolts and nuts to the right are probably to hold the hydraulic motor and actuator for the surf gate. It's a pretty cool feature for that type of specific sport boat and the rest of the boat is probably in good condition with that unique forward-facing VP outdrive, but the workmanship in the bilge is just terrible. Good point. Im not qualified to say if this gap is a manfuacturing defect (could be), design defect (didnt handle loads under normal use,), or shipping damage (from Nashville? ), or storm damage, but it doesnt look right. I don't think it's damaged repair. That looks like the top cap is two separate pieces meant to join at those flanges and they should be formed to fit snug to one another but ended up not being the case and there was a gap between the two flanges that they filled with a strip of plywood. And you can easily notice that it was wider at one point and was cut with a saw, as evidenced by a poor and uneven cut. I'd be contacting Chap directly go get that boat replaced with a new one. Before any more work is done to it. The manufacturing processes are vastly different. Cars are produced on an assembly line where one worked does the same small task time and time again. They become very adept at completing their task quickly and correctly. Whereas a boat is not produced in that fashion. A few skilled workers assemble the boat and perform multiple tasks each. With how many different steps each worker is required to complete in the process, it’s not impossible to miss something, or rush a step and not make it perfect.